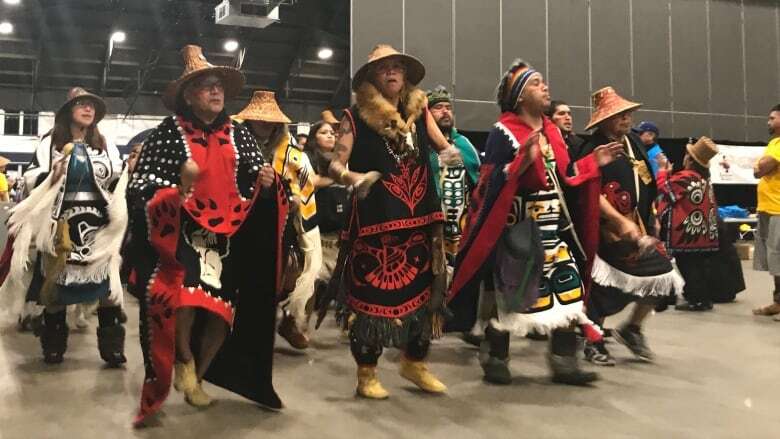 Hundreds of people filled the PNE Forum in Vancouver to celebrate Hobiyee, the start of the Nisga'a new year, with song and dance. The Nisga'a nation is located in the Nass Valley in northwest B.C., and the Nisga'a Ts'amiks Vancouver Society says 1,400 Nisga'a live in Vancouver. According to the society, Hobiyee is a celebration of the waxing crescent moon. The position of the moon and stars serve as a prediction for the coming harvest. Shelley Joseph is with the Urban Kwakwaka'wakh Dance Group, one of 13 groups performing at Hobiyee this year. "I'm so excited. My heart is pumping," Joseph said. "Just the feeling in the room, the rhythm of the drums and knowing that we're all connecting as one with other nations." Joseph pointed out the young children taking part in the celebrations mark a difference from previous generations who hadn't had a space like Hobiyee to share their culture. "This is normal for my son who is 11, whereas it wasn't normal for [previous generations]," she said. "It gives them a sense of belonging and a sense of pride, where a number of Indigenous people for a number of years haven't felt that, especially in the urban settings to feel a connection, and that we belong." Everyone is welcome to celebrate in the two-day celebration taking place on Feb. 1 and 2 at the PNE Forum.